Do you like to act? Can you connect with kids? Do you enjoy making the Bible come alive? 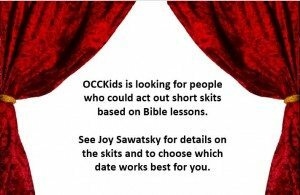 OCCKids has a place for you. We are looking for people (of all ages) who can act out short skits. See Joy Sawatsky for more details.